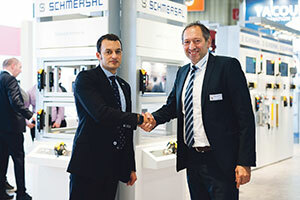 The Schmersal Group, leading international provider of machine safety, and Satech Safety Technology, one of the European market leaders for modular safety systems for industrial automation, have entered into a global sales partnership. The product ranges of the two companies complement one another perfectly, meaning they can now offer complete systems to protect people and machinery in industrial production. Schmersal primarily develops and produces solenoid interlocks, safety sensors and safety controllers to keep guards safely closed which protect operating personnel from dangerous machine movements. Satech focuses on developing and producing modular safety components such as safety fences, doors and accessories.